All children, no matter where they live, should have a chance to make their own nature discoveries and fall in love with everything that is wild and wonderful. 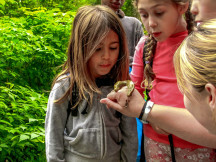 SPES launched a new fundraising campaign this week to give more inner city students a chance to truly experience nature on their door step, right here in Stanley Park. We want to raise $10,000 to give 250 of Vancouver’s most economically disadvantaged children an opportunity to get excited about towering cedars and firs, beavers and slimy slugs by inviting them to join our Urban Camping Nature Immersion Program this spring. To read more about how we want to help these students and to donate, click here.